It's time once again for WSM Smoke Day! 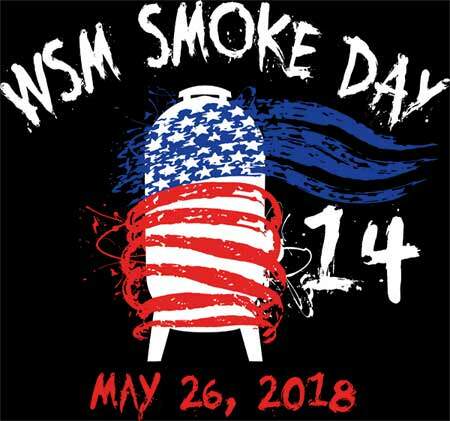 As is our custom, we'll be celebrating the 14th installment of WSM Smoke Day on the Saturday of Memorial Day Weekend, May 26, 2018. Of course, you can plan your Smoke Day celebration for any day before, during, or after Memorial Day Weekend depending on your schedule. Each year I like to give credit where credit is due. WSM Smoke Day was the brainchild of TVWBB member Joel Kiess. He suggested the event as a way for WSM owners to share their enthusiasm for the Weber smoker and for cooking barbecue. The idea is simple: use this forum to discuss what you'll be barbecuing on Smoke Day, cook it and photograph it on Smoke Day, and discuss and share your photos here for all to see! Some members may be planning local Smoke Day meet-ups. If you'd like to host (or attend) a get-together in your area, post here so we can coordinate between members. "But I don't have a WSM!" you say. The good news is there's plenty of time to order one from Amazon.com before the big day. But if not, don't worry, all brands of smokers are welcome. Pin yourself on the Smoke Day Map to indicate your participation. And don't forget to order your WSM Smoke Day 14 t-shirt available in many colors and sizes. So start planning for WSM Smoke Day 14! I'm looking forward to seeing how everyone celebrates this year! Thank You Again! Joel and Chris for inventing/hosting this AWESOME event! We look forward to it EVERY YEAR! With Much Enthusiasm! However, the annual Smoke Day in Raymond will be postpone this year, and I am very sad (mad) that it will be. but upset the landscaping company doing the project will not start until the 22nd of May and will not finish until the 8th or 9th of June. We look forward to the Grand Reopening Smoke Celebration in Jun or Jul Jim. Excited for my first WSM Smoke Day! Look forward to seeing what everyone is cooking and hearing the stories. Cheers! Looking forward to this year's smoke. I've missed a few in the past, but looking forward to this one. I am looking for my first Smoke Day this year. I'll be making brisket on the WSM and ribs and chicken on the kettle. long time lurker here in n missouri. I am posting this morning after starting the 1st pork butts of the season in my 18". waiting for the temp to rise and normalize. weather permitting i will be smoking briskets for Smoke Day. First post after lurking for four years. Wow! Welcome!